Are you completely sure about what you can achieve with restorative dentistry? Do you feel like you understand the generally concept – that restorative care will help get your smile back to the state of good health and complete structure that you once enjoyed – but you don’t have many details regarding the limits of this dental area? The good news is that restorations offer extraordinary improvements for your smile. 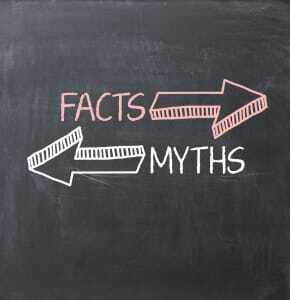 Find out more by considering some myths – and corresponding facts. Myth: You only need restorative dentistry treatments if you don’t take good care of your smile. Fact: Actually, even patients who take exceptional care of their smiles with committed attention to dental hygiene and office visits may still end up in our chair for restorative care. Some damage is completely accidental (such as an unexpected chip, break, or crack). Keep in mind that restorations are not a punishment – they’re a wonderful way to return your smile to comfort, good health, and optimal function. Myth: Restorative dentistry treatments will fix your smile but they will also require you to experience some discomfort during the procedures. Fact: Restorative care is completely comfortable. In this modern age of dental care, we offer compassionate, gentle care as well as local anesthetic. We will never begin your procedure until we have ensured the appropriate tissues are numb and you are relaxed and ready. Myth: If you need to replace missing teeth, this is not something covered by restorative dentistry – you need a specialist to help you achieve a complete smile. Fact: When we say that we will restore your smile, this includes replacing missing teeth. We offer multiple options (all beautiful and lifelike) to repair your smile after tooth loss.